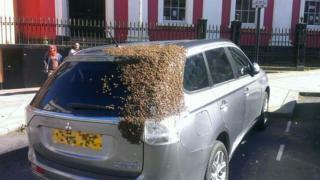 A car became the buzz of a Pembrokeshire town after hundreds of bees swarmed on its boot. The swarm, which gathered on the Mitsubishi Outlander in Castle Square, Haverfordwest, on Sunday, was spotted by Pembrokeshire Coast National Park ranger Tom Moses. He managed to reach some beekeepers who rounded up the insects. Mr Moses said the sight of the swarm was "spectacular". The 41-year-old said he was travelling through the town at about 17:00 BST when he spotted a "big brown splodge" on the back of the vehicle. "It was quite spectacular to see. There was a lot of people in town and when they were coming past they were really amazed by it, cars [were] slowing down and people [were] taking pictures of it." Mr Moses, of Haverfordwest, said he often talks to people about the struggles bees face as a result of pesticides and habitat destruction. "I was a little bit concerned, with it being in the middle of town, on a Sunday, outside a pub, that someone might do something stupid and get hurt or do something stupid and hurt the bees," he said. Two beekeepers helped to round up the swarm, after Mr Moses contacted the Pembrokeshire Beekeepers' Association. And despite being stung while assisting, Mr Moses said he was glad to have intervened. "At the national park, we like people to be aware of how important bees are and how people should be looking after them," he added.